Skipper Sam Morsy points to the return of Wigan Athletic’s newest ‘Three Amigos’ as proof they will have more than enough to hold on to their Championship status. Latics return from the international break against Brentford this weekend, hoping for a repeat of the 5-2 demolition of Bolton that lifted them three points clear of the drop zone. The scoresheet featured Gavin Massey, Michael Jacobs and Nick Powell – who have all missed half of the campaign through injury. And Morsy says the return of the trio points to a positive finale to the campaign. “It’s great to see those lads back on the field, it doesn’t half help!” Morsy said. “It’s your three main players, really, attacking wise. “And it has been very hard to have to do without them for so long. “Any team would suffer without players of that quality, it’s just the reality of the situation. “You also have to respect the fact you are Wigan, and there’s not an unlimited budget where you have 22 players of equal quality. “You’d like to have two players of comparable ability in each position, so any change is like-for-like. “But you have to spend a lot of money to be able to do that, and obviously we’re not in a position to be able to so that. The mood around Euxton during the international break has been totally positive, after the morale-boosting bashing of Bolton. 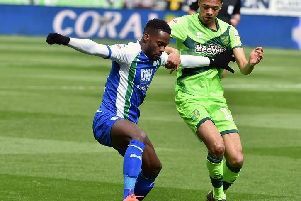 Wigan Athletic star wants to 'sort' new deal! “If we’d have lost against Bolton, it would have been such a long international fortnight,” acknowledged Morsy. “It would have been a disaster – simple as that. “But that’s football...when you win, you’re on top of the world, when you don’t, it can feel like the end of the world. “We desperately needed a performance and result like that. “For everyone – the players, the fans and the manager. “We’ve probably let the manager down a bit in the last few weeks, if we’re being honest.